Experience the charm of the Irish canals. As a boater, winding along the canals, one of the most frequent questions asked, as one chats to people on the bank or at locks, is “where can I hire a barge?” Of course, seldom is the information to hand, so this is an attempt to rectify that situation. These boating businesses offer people the opportunity to experience barge life on the canals, from an evening dining on board as the crew navigates through the locks, a day trip with a skipper or self-skippering, to a much longer self-catering stay. 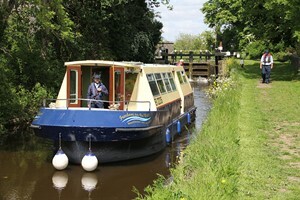 The fit-out on each is comfortable with all the facilities one would expect on a canal boat. Each of these ventures has their own website with information on rates and in many cases answers to those frequently asked questions. 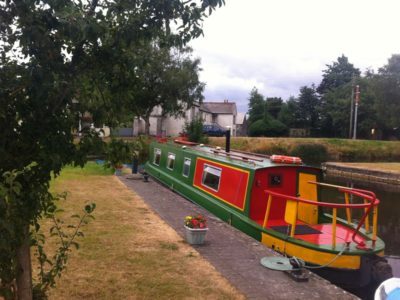 Dublin Barge Hire started in 2013 by Mick and Trish. Operating from the Outer Basin in Grand Canal Docks, they offer self-catering accommodation for as little as one night or for a week or more. Their barges are ideal for two adults but can cater up to four adults and two children. You can opt to stay in Grand Canal Docks and experience all Dublin has to offer close by or take a cruise through the Inner Basin and west along the Grand Canal past Mespil Road to Portobello and back. This is an opportunity to experience a different view of Dublin. Also in the heart of Dublin on the Grand, are two restaurants offering a distinctive dining experience, La Peniche Restaurant and the Cadhla Restaurant. 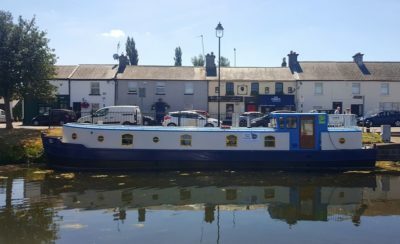 Further west along the Grand Canal is Bargetrip in the newly redeveloped harbour in Sallins. Barge Amo is a Licensed Passenger Boat carrying up to 12 people; your skipper will give you a unique insight into the life and history of the Grand Canal. 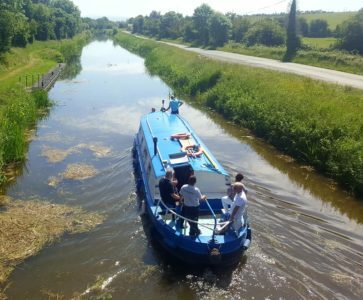 Setting out from Sallins, you can choose different options, including a one-hour cruise to the Leinster Aqueduct or a two-and-half hour cruise through Digby Lock. You can also hire the barge exclusively for your group. Advance booking is essential. These trips are also an ideal opportunity to experience the rural canals for those thinking about buying their own boat. This stretch of canal is particularly lovely with a rich history. is located on the Barrow Line of the Grand Canal in Bell Harbour, Monasterevin. Near the train station and exit 14 of the M7, their two barges can accomodate up to four and are available for short breaks, weekly or longer term. Further south on the Barrow Line of the Grand Canal is Barrowline Cruisers located in Vicarstown, Co Laois. 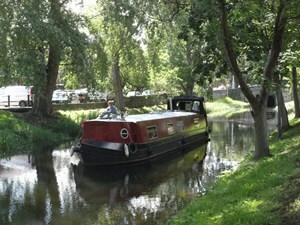 Orla and Philip have a fleet of self-catering barges with accommodation for three to eight people. The fleet consists of both narrow and wide beam barges, all fully equipped for you to explore the full extent of the Grand Canal and head south onto the glorious River Barrow. Barges are for hire by the day, week or multiple weeks. 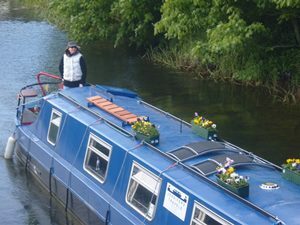 Athy Boat Tours provides one to five hour tours on the Barrow Navigation. 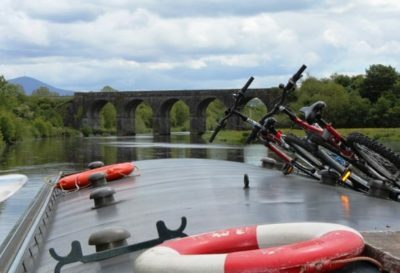 They work with your group to create a tour for you, whether you wish to enjoy a picnic on board during your tour to Levistown or lunch on the riverbank during a daylong trip to Maganey. Their boat is wheelchair accessible. 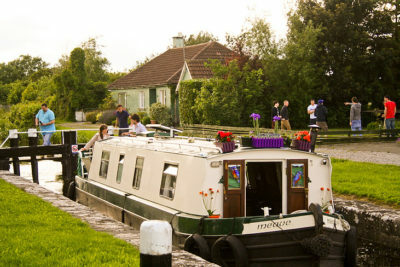 Rent My Barge operates from Maynooth, Co Meath, on the Royal Canal. You can travel either west towards Kinnegad or east as far as Castleknock and back. They offer self-catering holidays from a couple of days to a week or more on the Barge Maeve, catering for up to six people, but is deemed more comfortable with two to four.